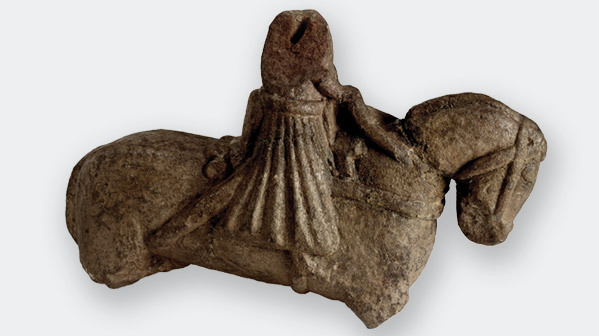 It may not look much, but this damaged figure of a horse and rider, found in 1844 at Knockmannan Hill near Kinnitty, Co. Offaly, tells an important story. As a piece of freestanding sculpture of a nonreligious subject it is rare, but its significance lies in something that would have been immediately obvious to any thirteenth-century viewer; the horseman is Anglo-Norman. How do we know? He is using a humble object that made a big impact on European history: the stirrup. Images of the Norman knight centre on the big-ticket items of military hardware: the armour, the kite-shaped shield, the lance, but what made the Norman cavalry charge so mighty a force was the humble stirrup, which anchored the rider to his horse and gave him the control necessary for disciplined concerted action. Irish cavalry, by contrast, were lightly armed and did not use stirrups. Nevertheless, these military advantages did not allow the Anglo-Normans to subdue Ireland easily. Henry II’s power was threatened by revolts in his Breton and Gascon territories, drawing some of his followers away from Ireland. Conflict with Irish kings continued. In 1175, Henry signed the Treaty of Windsor, witnessed by the archbishop of Dublin, Lorcán Ua Tuathail, assigning Dublin and the south-east to the Anglo-Normans and the rest of Ireland to the control of the high king, Ruaidrí Ua Conchobair. The deal, however, broke down—neither Henry nor Ruaidrí was able to exert authority over his own side. Rapacious Anglo-Norman warlords continued to carve out new territory, with John de Courcy invading Ulster in 1177. Henry’s appointment of his ten-year-old son, John, as Lord of Ireland that same year did nothing to end the turbulence. When John finally came to his Irish domain in 1185, his stay was brief and ineffective. Irish history might, nonetheless, have been different had John managed to establish a separate Irish kingdom. Instead, he succeeded his brother Richard as king of England in 1199, and Ireland remained as a ‘lordship’. Although fighting with Irish kings continued during John’s reign, the Anglo-Norman colony did consolidate itself, literally, by placing those most imposing new features on the Irish landscapes—castles. Castles were not unknown in Ireland: Toirrdelbach Ua Conchobair built three in Connacht in 1124, but the scale of the castles John had built at Lismore, Dublin, Limerick and elsewhere, or those built by Hugh de Lacy along the north-east coast, was new. They gave imposing physical form to more subtle changes, such as the introduction of the first national coinage and of English common law. Armed adventurers were followed by farmers, traders, clerics and administrators. These ‘Normans’ who came to Ireland did not necessarily have their roots in Normandy—many had English, Welsh, Flemish or Breton forebears. Indeed, the loss of Normandy itself to the English in 1204 spurred on the development of the colony in Ireland. During the thirteenth century, it created a system new to Ireland: that of villages, manors, parish churches and the most loved of Irish entities, the county.